Bad boy, bad boy – Whatcha gonna do? We approached Ciudad de Mexico with a combination of trepidation and enthusiasm. This city of over twenty two million was once the largest on the planet, but now is merely ninth or tenth. We drove to Teotihuacan, where we would be met the next day by Eduardo, who would guide us into the downtown area. In Teotihuacan we found a campground in town. It was surrounded by a church, a prison, a market, some restaurants, and a military camp. The campground, like all private properties here in Mexico, was gated, walled, and fenced in. It was populated by fellow travellers, Canadians and Americans, who were there to see the pyramids. There was even Reed and Joanna, the couple from Arizona we had camped beside in Guanajuato. We had just finished setting up and were enjoying a snack and a drink when a white van came to a stop on the other side of the fence, maybe thirty feet away from us. A man got out, armed with a pistol. Another followed carrying a black assault rifle, pistol in holster. These two were followed by several more with pistols, and all but one went down the street toward the prison. The last one stayed with the van. The men were dressed in everyday clothes, not the ubiquitous military uniforms we had seen everywhere. There was also a significant armed police presence, more than usual. It turns out that several prisoners were about to be released. These men had served nine years for what we did not know. We did know that they had considerable public sympathy, and that problems were anticipated. Our proprietress assured us that if there were problems, they would not spill over into the campground. As for the present, the only problems that did overflow were the loud explosions coming from the midday fireworks across the street and louder bangs coming from some kind of weapons in the military camp. We swapped notes and tales with our fellow travellers. These talks are a combination of enthusiastic reports of things seen and done, and debriefings on a variety of concerns and frustrations. We decided that we would see the pyramids in the morning, early. We found a lavanderia and dropped off our bag of dirty clothes. These we would retrieve after twenty four hours and a few pesos. The clothes always come back fresh, packed, crisply folded and buttoned. Back at the camper, I fixed our reflective tarp over the truck cab where Finn would stay while Paula and I visited the pyramids. The cab being the closest thing to home he has on this trip. Getting this ready the night before would save time in the morning. We wanted to arrive before the gate opened. We enjoyed a couple more drinks as we watched several Catholic processions, complete with statues of saints or virgins, move down the street toward the prison. The explosions from the military camp resumed sometime early in the morning. They continued with some frequency throughout the night. These, and the occasional waft of sewer, contributed to a restful sleep. We awoke at six thirty and quickly got dressed. The gates would open at eight and we still had to eat and find our way to the site. Clothes on, dog in the cab with food and two bowls of water. It is our practice to crack the windows on each side a couple of inches to let air in for Finn. Small enough that an arm couldn’t get through, but enough for air. We also leave the back window to the camper wide open, as access to the truck itself is blocked by the locked camper. Dog watered, secure, and in the shade, Paula and I headed down the street. We grabbed some coffee, food, and a cab. 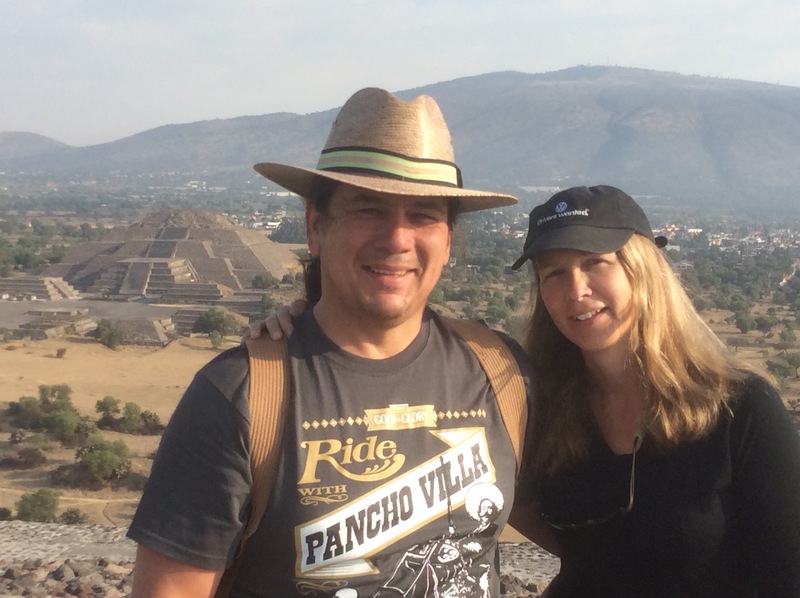 We were off to see the third largest pyramid on Earth! Teotihuacan has several pyramids. The two largest being the Temple of the Moon and the Temple of the Sun. We climbed the steep stone steps alone up the Temple of the Moon, only to be blocked at the first terrace by cables and signs that restricted access to the rest of the ascent. It was still a bit disappointing not go up all the way, however it was a great place to take photos of the enormous Temple of the Sun, the world’s third largest pyramid. We hiked over to the Temple del Sol. 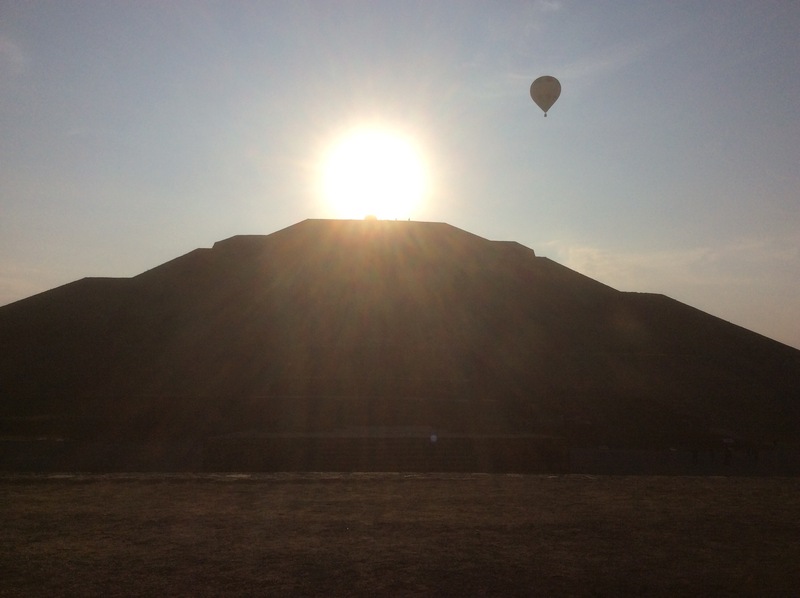 Standing directly in front of this enormous pyramid, we watched in awe as the sun rose directly above the peak, as though it were playing peekaboo. The structure fell away into a perfectly symmetrical silhouette, as though it were designed to hold the sun on top. We hiked up the steps – slowly. It is something to stand up there, on top of a two thousand year old pyramid, first thing in the morning. A man and woman meditated. Another woman chanted while drumming softly. Most of us gawked and took pictures of the smaller Temple of the Moon. Paula called her family. We spent about half an hour on top. Then we toured the rest of the enormous site. We looked at frescoes. We looked at masks and pottery and skeletons. We resisted attempts to sell us hats flutes masks textiles jewellery. We viewed two other satellite sites that were remote. We got the ‘no’ feeling from the unwelcoming stares of locals and site staff. We left. This was the first time on our trip we did not feel welcome. Eduardo would later tell us that this place was one of the worst in the country! Walking back we passed some archaeologists working on a dig. They showed us some steps they had uncovered and some fragments of artifacts. We hailed a cab, knowing that we had to meet Eduardo at two o’clock. We grabbed our laundry and hurried to the campground. The day was hot, so letting Finn out was a priority. Rounding the corner, I called to the dog. I couldn’t see him, but he often sleeps in the cab, so I was not concerned. I called again. A shadow moved from the camper into the cab. It was Finn. It was as though a bomb had gone off inside the truck! The entire back of the truck was level to just above the seats with white feathers! 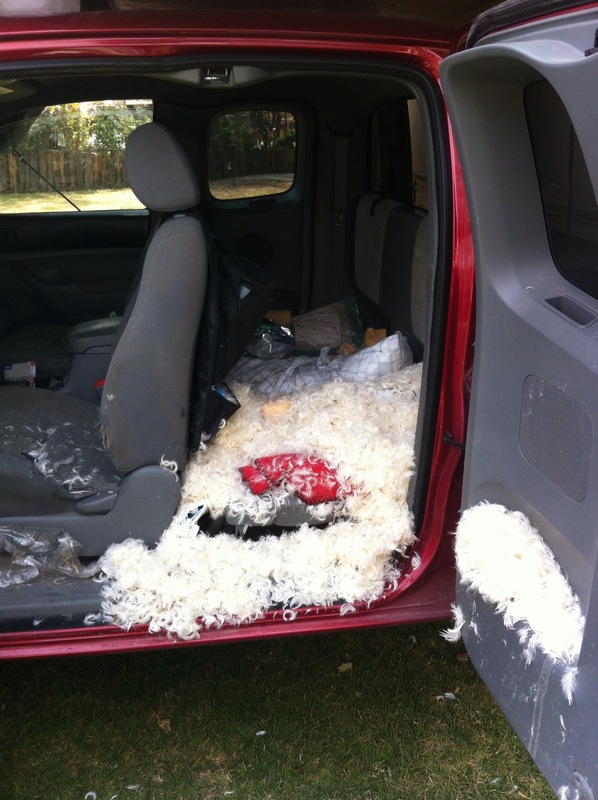 Feathers were in the door compartments, in the storage on the seat backs, under the seats, between the seats. Feathers, feathers, and more feathers. An avian Armageddon. The dog’s water had been absorbed by feathers. His dog food was mixed in with the feathers. Feathers were floating and spilling over like the pot of porridge that wouldn’t stop boiling. The screens between the cab and camper was torn out. Both of them. The camper window to the cab had been smashed! 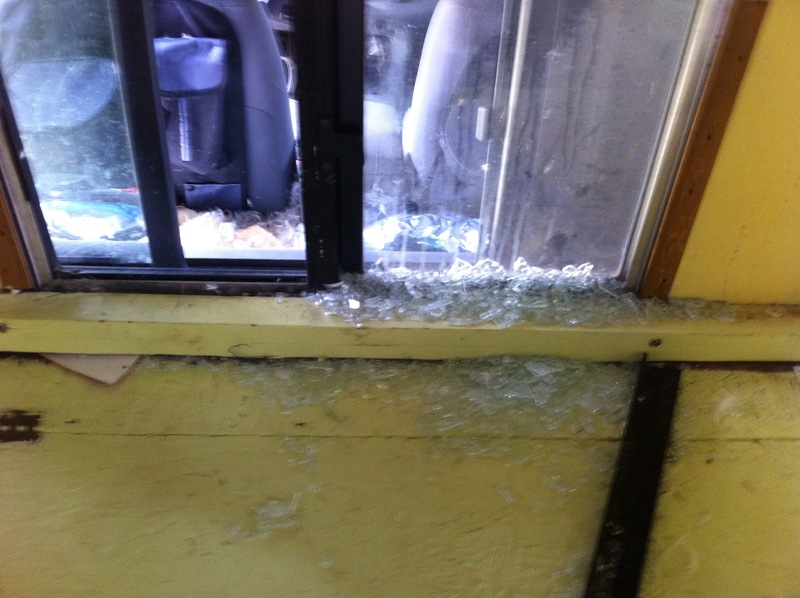 There was glass everywhere inside the camper. 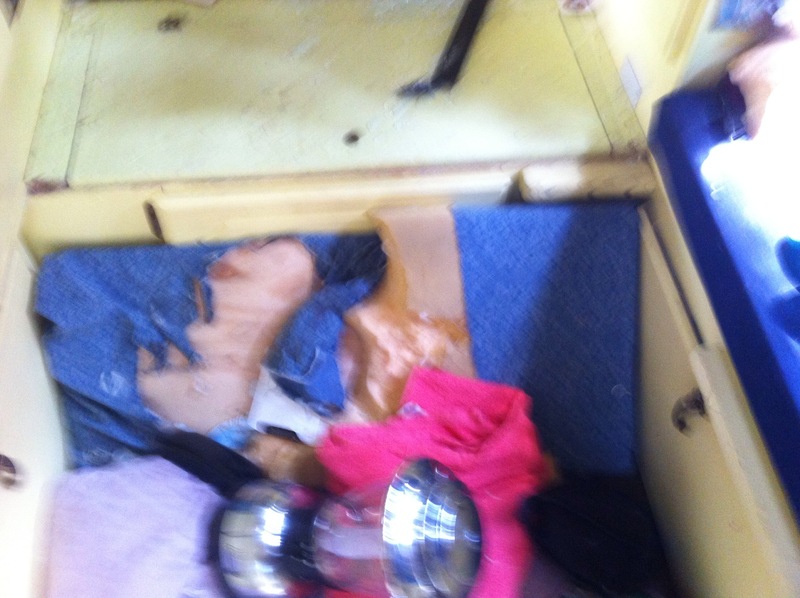 A huge hole was torn in the side of the camper canvas. All of our pillows had been shredded, but not the dog’s. The campground lady told us that the dog had been quite stressed. We figure that maybe it was the ongoing booms from the military camp. Finn had gone on a rampage. That was three days ago. The tear has been patched. The glass is still a problem. Feathers are still floating in the cab. Oh guys what a disaster!! Trust all is mended, except the guilty look on Finn. We have to say- the pic of the 2 of you is beautiful- so relaxed and happy. It is a keeper. Keep writing, Douglas- we love to read and imagine. ps Fiver to Finn- Staples come out tomorrow..wonder what that means. Street is quiet, boring without you.Am waiting for YOUR blog to start. What a tail that will be. Love the feathers..very dramatic! You have a gift- please keep blogging – makes us feel present with you! Safe journey. Thanks for the encouragement, Heather. Douglas enjoys writing the blogs. That’ll learn ya to leave Finn whilst you go gallivanting! Yikes! Enjoy your blog and pics. Quite an adventure! Still going all the way to Panama? An hour from Panama right now. We shall see. Borders are a pain in the @&$?&$&$!!! down here.